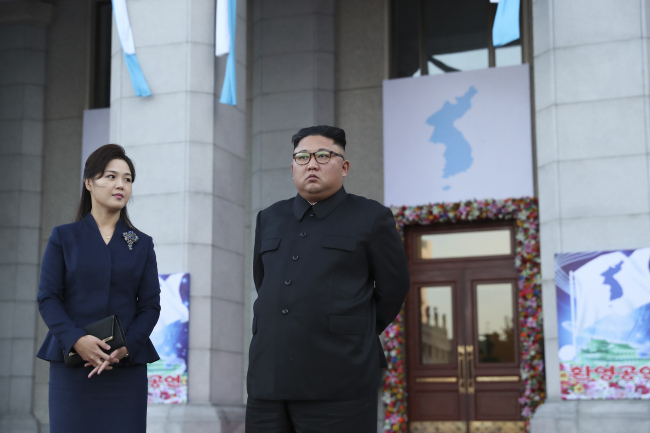 North Korean leader Kim Jong-un on Wednesday reaffirmed his country’s resolve to denuclearize while vowing to visit Seoul this year. If the trip takes place, Kim will be the first North Korean leader to visit the South Korean capital. “(The leaders of South and North Korea) have pledged to make the Joseon (Korean) Peninsula a land of peace with no threat of nuclear weapons. ... I also promised to (South Korean) President Moon Jae-in that I will visit Seoul in the near future,” said Kim in a joint press conference held by the two leaders at the state guesthouse Paekhwawon. The press conference followed the second round of talks during the Pyongyang summit. Moon said North Korea had decided to permanently dismantle the Tongchang-ri engine testing and missile launch site, with outside experts in attendance. He also said additional measures, such as the permanent dismantlement of the Yongbyon nuclear facilities, could be undertaken by the North depending on what reciprocal measures were taken by the US. Moon also said he and Kim had agreed for the Koreas to work toward jointly hosting the 2032 Olympics. Moon added that Kim’s Seoul visit, barring unforeseen developments, would take place within this year. No North Korean leader has ever visited Seoul, although there had been talk about Kim’s father, former North Korean leader Kim Jong-il, visiting in 2000. On the sidelines, the defense ministers of the two Koreas signed an agreement to ease military tensions along the border.